Writers, artists and list makers will love to receive a beautiful Scrappy Journal this holiday season. 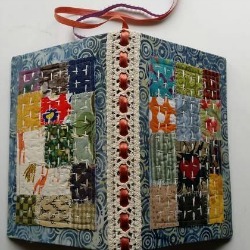 Craftylittlemonkey shares her tips for creating a whimsical one-of-a-kind diary using scraps of fabric, ribbon and paper bags. This tutorial can also be used to craft a small calendar. To make the journal even more meaningful; add a monogram or quote for a more personal touch. Switch out the paper bags for fabric to create a stitchy memento. Crafting for the people in your life is easy when you use our Handmade Holiday Gift Guide. Aw, I love this is a gift suggestion. I hope somebody will make one :).